Although the text retains its foundation on property law, new lead author, Marissa Pagnattaro, University of Georgia, and the entire authorship team, bring a fresh perspective emphasizing the importance of understanding laws and regulations that are fundamental foundations for business. Using court cases and examples in Sidebars that are relevant for business, we underscore how learning about the law is essential to understand how the law can be used for strategic advantage and how to develop sustainable business practices. 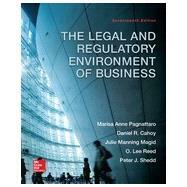 This emphasis, along with the rich array of cases and examples, makes the text suited for both legal environment and business law classes. Also new to this edition, Smartbook®, the first, and only, adaptive reading experience for your students powered by McGraw-Hill Learnsmart®, the market-leading adaptive study resource. Smartbook is designed to change the way students read and learn by continually adapting highlighted content based on what a student knows and doesn’t know. The end result? Students are more engaged with course content, can better prioritize their time, and come to class ready to participate.